As the kids start back to school, we go back to work, and our “normal” schedules resume… I’m hoping that this mama doesn’t just jump back on that same hamster wheel. 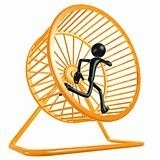 Running endlessly, getting nowhere, fighting the same bad habits, getting sucked into whatever drama comes along… No more wheel for me! I remember when my kids went through that nasty rat stage. (Although I have to say the reptile stage is really what nearly did me in.). Anyway, most kids go through a stage where they think small furry rodents are wonderful and should be given a place of honor, usually a $100 cage in the middle of their bedroom where said furry creature can poop and spin to its hearts content. 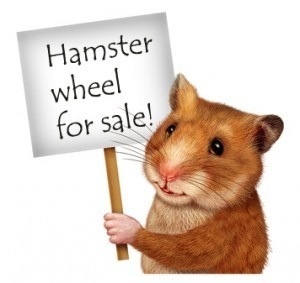 Besides the constant nagging to clean the cage, trips for more hamster food and hay, I do remember their excitement at purchasing new contraptions for the latest rodent. There’s colorful tubes, round plastic balls to ride in, and all kinds of expensive and fun looking toys to keep the pet stores in business. 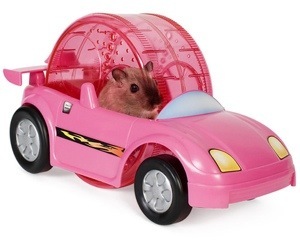 However I have to admit that even I got excited about the hamster CAR! Resembling a VW bug, it had a smaller hamster ball inside for the hamster to propel itself across the room. For $29.95 it was a good 20 minutes of lively entertainment. I think even the hamster got bored. I guess I’m just saying that there comes a time when all of the latest gadgets in the world don’t make the same old rat trap any more enticing. So I’m seeking a new path. Or maybe it’s just a new perspective. I want to enjoy the ride, the thrill of the spin. I want to laugh when I run into obstacles in my path, and see it as a challenge, not a problem. I want to take a moment to enjoy the view, savor the experiences. Maybe the hamster has it right… Eat, nap, poop…. And laugh wildly when you figure out ways to escape. Now I just have to figure out how to write that out as a measurable goal…. Previous Post 2014 the Year of Potential! Next Post Parenting with LOVE: peace and patience not guaranteed!